A vernacular reference to the adoption of Christianity by Native Americans. In many, but not all, cases, the "road to Jesus" was long, heartbreaking, and ultimately a colonial expression of forced acculturation. Contemporary usage of the phrase does not necessarily refer to the term's colonial history of violence, but the valence of subjugation is doubly resonant in that the journey toward Christianity for both Jesus and Native Americans was a bloody one. 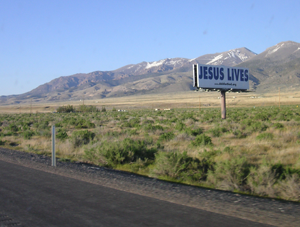 "Jesus lives road sign, May 5, 2006" by Beatrice Murch.